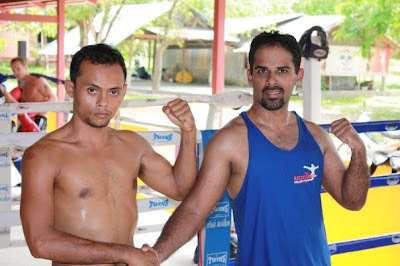 I just got from my 3 week training holiday to Thailand where I spent 2 weeks training at the Rawai Muay Thai Camp. I’ll have to say, that it was easily one of the hardest things I’ve done in my life. Prior to visiting the camp I had not been Muay Thai training for around 3 months and even though I am relatively fit, I did struggle through these 2 weeks. I managed to do both these classes on my first day and a couple more days towards the end of the week, but I was so overtired and hurt after a few days I did not have the energy to put in 4 hours a day anymore, I did however make it for at least 1 of these classes everyday for the entire 2 weeks. I also did 4 VIP classes with Chai and Fhad who were both great trainers. I preferred FHAD as he worked me had and made sure I clean up my technique. Whilst I was there I had the great opportunity to see some great Muay Thai fights, mainly 2 of Petsila (Who also trains students at the Gym). He is a great fighter and he picks some amazing opponents to fight with, the fights are were so evenly matched that they both went into 5 rounds and were decided on points. I learned some important lesson whilst I was in this camp, of these the most relevant was ‘respect’. The trainers ‘drill’ respect into you throughout the day. You always bow at your trainers and opponents and this makes you appreciate what makes this sport so addictive, you are trained to understand that Muay Thai should only be used inside a ‘boxing ring’ and nowhere else. I also learned the importance of the words ‘no fear’ (my trainer Fhad kept shouting this at me throughout sparring and pad work) where to really practice Muay Thai you have to get over the fear of getting hit and be bold, stand up straight and take on your opponent with absolutely no fear at all. And finally, the importance of discipline and motivation. With Muay Thai it’s all about “how much do you want it”, you can never go into a training session ‘half assed’, as you will struggle. You need to want it so much that you keep yourself motivated every time you walk into the gym/ring. Well, it was certainly a great experience in life for me and I very much want to do it again very soon. (I actually hoping to do it again this December / January and hopefully take my skills to a new level). I also love phuket so really looking forward to going back.